should be followed to ensure your package arrives safely. Ship no more than 100 Cord Rosaries per parcel to overseas Missions to help save them the cost of surcharges and taxes. and use a twist-tie at the other end. You can try bundling 10 together, but that's a little tricky. You don't have to twist tie the other end, but it helps to keep the Rosaries from tangling together. And it makes it easy for your recipient to open and distribute the Rosaries. Too many ties actually make more work for the missionary. For Chain Rosaries, we put each in its own bag. But you could also rubber band them the same way as the others. Agents distributing Rosaries for the Military usually require that each rosary be individually bagged. Small quantities of little zip bags are available at big stores, like Walmart, in the craft & sewing section. 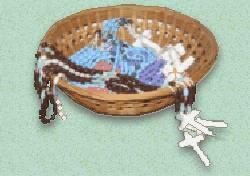 We use large generic brand twist tie bags for bundles of 50-100 cord rosaries. Tie each scapular's cords with a "shoe-lace" bow as shown below. securing the images with string or elastic band. We use brand name bubble shipping envelopes, sold HERE. We found Jiffy-lite are the lightest so you won't have to pay more for a heavier weight envelope. "Bubble" envelopes are an ounce lighter than "Padded." 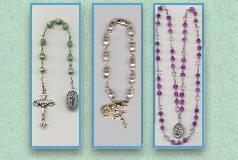 Size 8.5 x 11" will securely package 50 Cord Rosaries. We re-use all the Boxes that our own Supplies come in. Anything to save a penny! of more than 4 pounds weight. Otherwise, a bubble envelope works just fine. you must fill out a Customs Form at the Post Office. 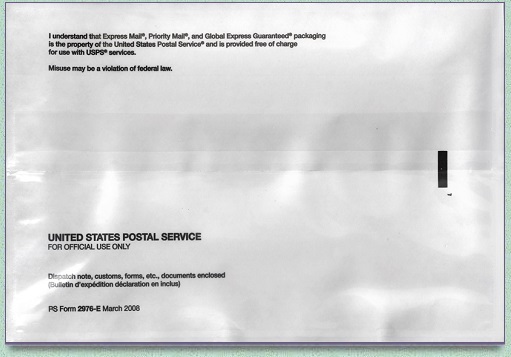 USPS has provided a new form 3/2010 which is filled out in duplicate. A side portion will be torn off and given to you with the matching customs form number. The above form is used for packages under 4 pounds. You'll be required to provide your Name, Signature, Address and list the Contents. We list the contents as "Religious Items." Listing greater value will cost your recipient Customs Fees! if his Country or Culture does not take kindly to Christians. The Customs Form Envelope is to be used with your own shipping label, or in conjunction with either Form 2976-A, which is printed online at USPS.com or Form 6182-Global Express. The customs form pouch is made with a strong adhesive and a one inch overlap at the opening of the pouch (top over bottom closure) to ensure that it stays on the package with the contents securely inside. The pouch is also large enough so that customers can easily fit all required documentation inside. such as your company or mission logo, etc. This also can cause trouble for your recipient, or your package may get "lost" or be destroyed by anti-Christian handlers, or will fall into the wrong hands. Never Mail Blessed Rosaries! Or any other blessed article. Rosaries have not yet been blessed by a priest. which will be delivered in countries outside the US hostile to the Christian faith. Missionary priests can always bless the rosaries when they receive them. when you are certain of who will be receiving them. as our insurance and delivery confirmation!